I busted out all my Prismacolor pencils instead of my Copic markers to color this cute squirrel image from Memory Box Co. I've been trying to practice pencil coloring while it's still fresh in my mind from taking Dave Brethauer's class last weekend. I've had this stamp for a while now but I was stuck on how to go about coloring it the way I envisioned. But after Dave's class, I applied all the techniques I learned and I'm so pleased with how it turned out! Yippeee! I kept the layout of this card really simple because I didn't want it to distract from the main image. In addition to the squirrel stamp, you also get what I call a little "bonus" stamp on the side of the wood block of a little acorn for coordinating with the main image. 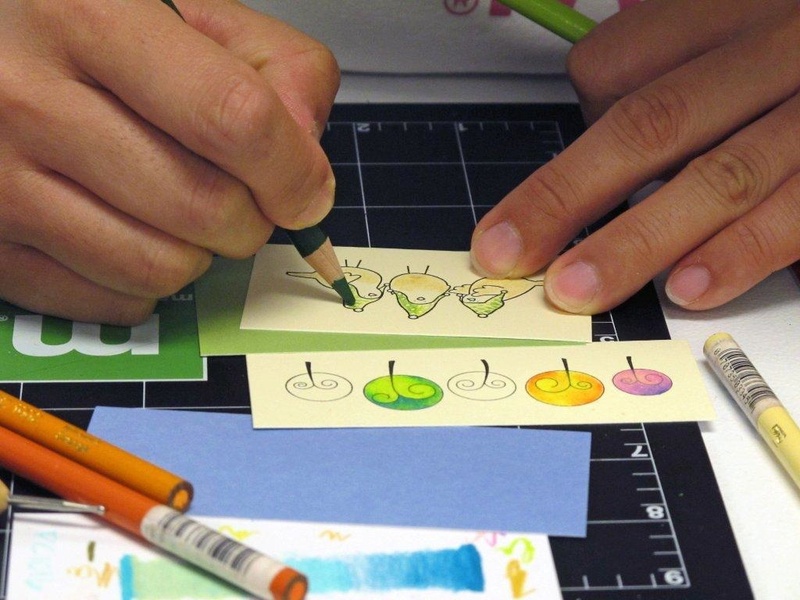 It's great for making your own background paper or to decorate the envelope with. Many of the stamps that Dave designs have a little stamp on the end. It makes you feel like you are getting a 2 for 1 deal! I used four different colored pencils for this cutie squirrel. I started very lightly by laying down a beige color over the whole squirrel. Then, I used a dark raspberry on the back and tail part and added a medium chestnut color over that. For the lighter areas, I blended everything together with a yellow ochre pencil. I really like the results! That is how I totally wanted my squirrel to look...love when that happens! I really love the apron on the squirrel...so adorable! You can choose to either color it in or paper piece it since it's an outline of the apron, it's very versatile! I used some pattern paper from the Gossamer collection from Memory Box for the apron and background. I also matted the card with some shimmery green cardstock and finished off with some rich chocolate satin ribbon. I like how this card has a nature and home-y...I'll have to make some more! Super fun day with Dave Brethauer of Memory Box Co.! Oh my goodness...I had such a great day at Paper Garden on Saturday taking a colored pencil class with Dave Brethauer (owner of Memory Box) and with my friend Wanda G! Although we have separately taken this class with Dave in the past, we always learn some new technique in refining our coloring skills. If you ever get the opportunity to take any of Dave's classes, I highly recommend it! He has so much patience and always stops at each table to demo each technique first hand. Dave travels to various stamp stores all over the States and shares his talent with all who want to learn about colored pencils and water coloring techniques. Aren't those three birds wearing hats the cutest?! I took this pic when I was supposed to be paying attention...oops! 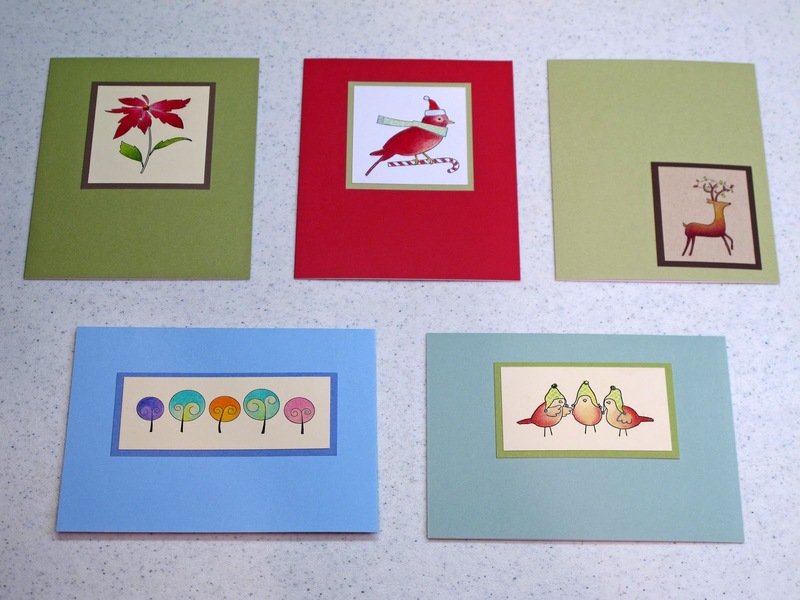 These are the five cards we made during class that Wanda colored and took a pic of. Wanda snuck a pic of me concentrating on coloring the hats on the birds. We used Prismacolor pencils. Oooh...the coolest technique we learned was to take the small end of a stylus (dry debossing) and making designs like stripes or dots on the hats before lightly coloring over the area. We thought it was so genius! Here's Wanda goofin' off before class started. She's gonna give me a hard time for showing this! Pic courtesy of Wanda G.
Here are some more card samples from the other class that Dave taught. 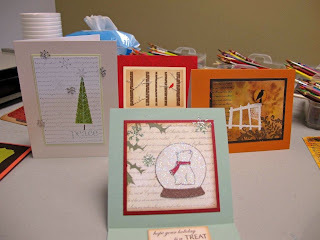 I love the polar bear in the snow globe easel card...so sparkly! After class, Wanda and I went to lunch at a restaurant called Lemongrass in Sacramento and had such a yummy meal! We saved room for dessert of course and we each had the most delicious coconut ice cream topped with chocolate sauce (for me) and caramel sauce (for Wanda). Oh, it was soooo good! I hope you enjoyed checking out all the pics of my fun crafting day! Oy, as you can see, my card is rectangular. I got so wrapped up in making sure I was using outline stamps that I forgot to make a square card...big oops! Oh well! First, I stamped the tree branch from the Landing Pad by Kim Hughes directly on the white shimmery cardstock and colored in the leaves with Copic markers. Then, I stamped the branch again on a piece of Birch Wood pattern cardstock from A Muse and just cut the branch part of the image out. The woodgrain was a contrasting white but I used a couple of brown colored Copics to darken it. Isn't the Tweet Bird from Memory Box so adorable? I stamped the bird onto a piece of Gossamer pattern paper also by Memory Box and cut it out sans the legs. I finished off the card by stamping the "Hello" sentiment by A Muse with Adirondack Espresso ink. I love how elegant that font makes the card! 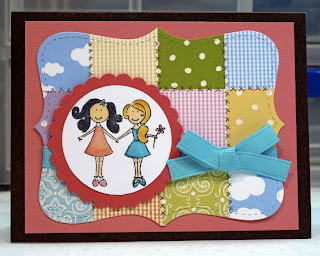 Have a great day and be sure to check out all the other creations for this challenge on the Simplicity blog! I made this recipe binder for my sister to help her organize all the recipes she likes to print out from her computer. Before, she used to keep the print outs stacked in two filing folders. I'm very pleased with how it turned out! It took me forever to come up with this design that I thought my sister would be happy with. She likes clean lines and nothing too busy with graphics and such. The yellow and brown pattern paper is from Craft Fair by American Crafts...love their stuff! The green polka dot strip on the side is by A Muse. The cute stamp images is a stamp set by Kim Hughes. Oh and that yummy bowl of guacamole was made from scratch by sister for my birthday weekend! For the spine of the recipe binder, I used the Stitched Uppercase Alphabet stamp set from A Muse. The letters in the set are clear so it was really easy to place each letter where I wanted them. I used some plastic tabbed dividers with pockets so the recipes could be organized by category. Of course I have to show a pic of the yummy food my sister made for my birthday celebration! We had steak and shrimp fajitas and salad Nicoise (per my request) from recipes in the binder. I pretty much ate my way through the whole weekend! Last, but not least, the yummy chocolate cake with fudgy chocolate frosting! It was super yummy! I celebrated my birthday at my sister's house this past weekend. I had a great time visiting and eating all the yummy food my sister made! I made this card for my BIL (his birthday is a day before mine) who is an avid golfer. All the stamps I used are from A Muse. I love how you can buy individual stamps and make a scene with them! I used a really light blue Copic marker (BG000) to color in the blue background. One of these days I'll invest in getting the airbrush system! For the grass, I used the Martha Stewart grass border punch and layered a small strip of grass behind the front green piece of cardstock for more dimension. For the inside of the card, I used two green Copic Sketch markers and "flicked" the brush tip end of the markers to make grass blades. I made the golf ball by cutting out a circle and used the Cuttlebug Swiss Dots embossing folder to make the dimples in the ball. When you open up the card, the ball kinds springs out at you! I made the "spring" by punching a smaller circle and cutting around it in a spiral. I have seen this technique in passing while blog surfing.